Mostly harmless? I think not! Any aliens who receive our old TV and radio transmissions will be raising their tentacles in submission once they get a glimpse of sci-fi’s greatest hitmen and their weapons of mass annihilation. Governments may spout platitudes about keeping space peaceful but we know that’s not going to work – besides, aliens can’t vote. Nope, patrolling the High Frontier is serious business so you’ve got to have a trusty space-shooter locked, loaded and close at hand. Better safe than sorry… besides, interstellar visitors packing books titled “To Serve Man” might not really be so eager to help. They could just be hungry. 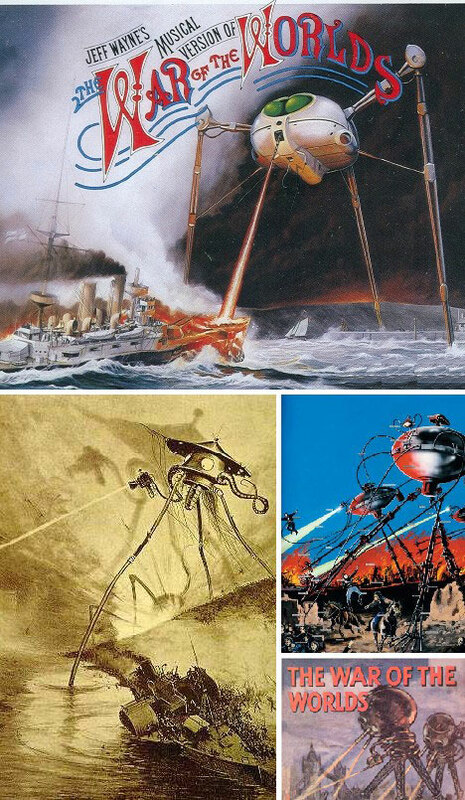 Some of the best science fiction comes from not the last century, but the one previous: The War of the Worlds was penned by H. G. Wells way back in 1898, around the time Teddy Roosevelt was leading his Rough Riders up San Juan Hill. Wells’ marauding Martian tripods set the theme for a wealth of classic sci-fi to follow, beaming unstoppable heat rays that could melt through the deck of a dreadnought. That’s the scene depicted on the cover of Jeff Wayne’s musical odyssey from 1978 (above, top) showing the valiant Thunder Child meeting a fiery end at the hands, er, tentacles of advanced alien technology. Early radio & movie serials and garish pulp comics brought sci-fi to the masses in the years before TV; looming large among the era’s pantheon of heroes are Flash Gordon and Buck Rogers. Though eager to drop gloves and raise fists at the first sign of danger, Flash & Buck had another way of dispatching annoying aliens and rampaging robots: the Ray Gun. Seen above (top) on the cover of the Foo Fighters’ 1995 debut album, the classic Buck Rogers “disintegrator ray” gun featured a trigger-activated rotating wheel and flint that emitted sparks. Flash (sorry) forward to the 1960s and sci-fi has not only come of age, it’s come to our TV screens. Star Trek had a very short run but its legacy has been huge: several spin-off shows, an abundance of movies and the explosion of geek culture. 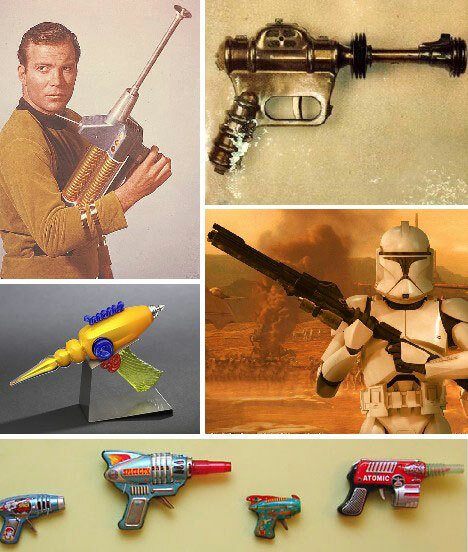 The sci-fi weapons of Star Trek are worthy of their own post but one in particular is worth focusing on… the successor to Buck Rogers’ ray gun: the phaser. Adjustable in strength from Stun, Heat, Disrupt, Dematerialize up to Overload and in either hand-held or the rarely used rifle, no smooth talking starship captain should leave the home planet without one. A later iteration of Star Trek would pay homage to space opera pioneers Buck Rogers, Commander Cody (not the Hot Rod Lincoln one), Rocketman and Mysterious Doctor Satan. Tune in next time for… oh all right, it was Star Trek: Voyager and the tribute was in the form of The Adventures of Captain Proton, Tom Paris’ favorite holonovel. 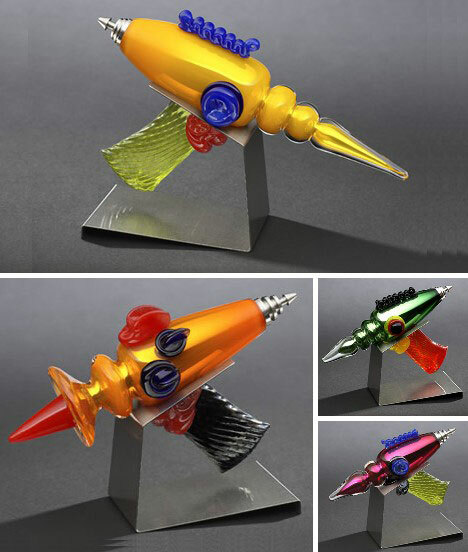 Defending the Earth from Doctor Chaotica required some serious weaponry, such as the nifty raygun above. 1982’s Tron was arguably the first film to extensively use CGI and nearly three decades later it stands up remarkably well. 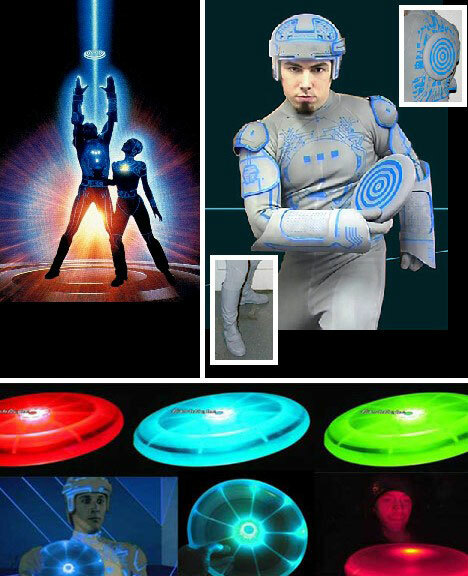 Tron’s deadly weapons were not what many expected – flying, frisbee-like discs that nevertheless packed a punch when directed at the evil Master Control Program. 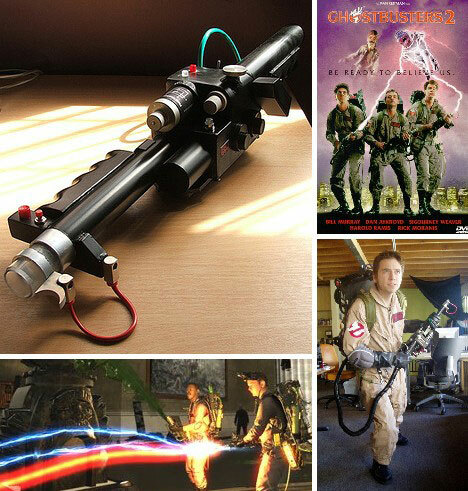 “There’s something very important I forgot to tell you: DON’T CROSS THE STREAMS. Try to imagine all life as you know it stopping instantaneously and every molecule in your body exploding at the speed of light.” Words to live by… or die by, it’s your call. As we all know, however, Egon Spengler’s maxim could, under certain circumstances, be disobeyed. That’s the way things go in the Ghostbusters universe and when you’re packing Positron Collider rifles, nobody’s gonna second guess you. The Stay Puft Marshmallow Man did and he paid dearly. 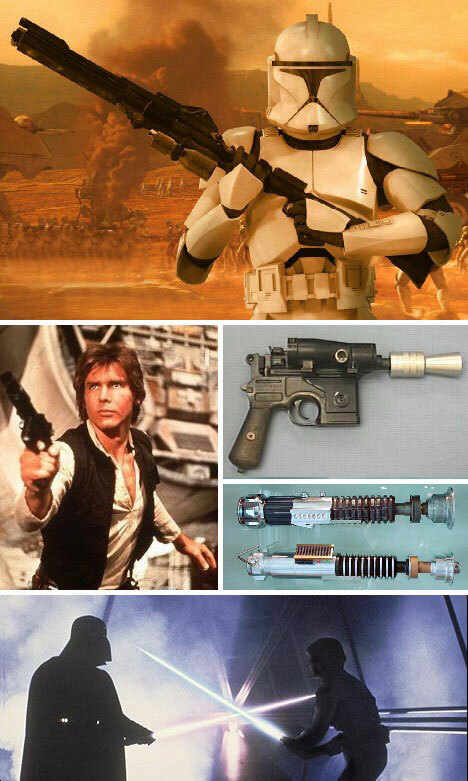 There’s more weaponry in the Star Wars saga than one could shake a lightsaber at but we can whittle them down to three essentials: the notoriously inaccurate stormtrooper rifle, Han Solo’s DL-44 blaster and, of course, the lightsaber. Even though the latter figure prominently in many of the film series’ most memorable scenes, take it from Han Solo: “Hokey religions and ancient weapons are no substitute for a good blaster at your side, kid.” Amen to that! 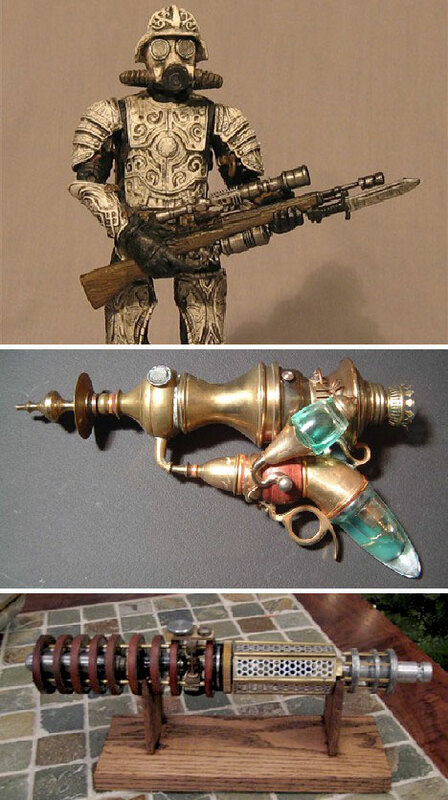 Steampunk and Star Wars – a marriage made in heaven? The folks at Steam Wars seem to think so and the site is a cornucopia of creative geekishness. 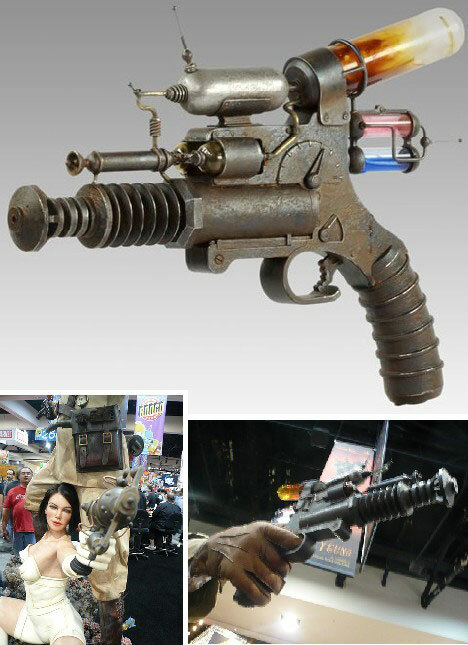 Most anything Star wars can be adapted to steampunk style and, surprisingly, it works! Just take the stormtrooper, hand blaster and lightsaber above… and crank up the boilers, Lord Vader’s fired up about something again. 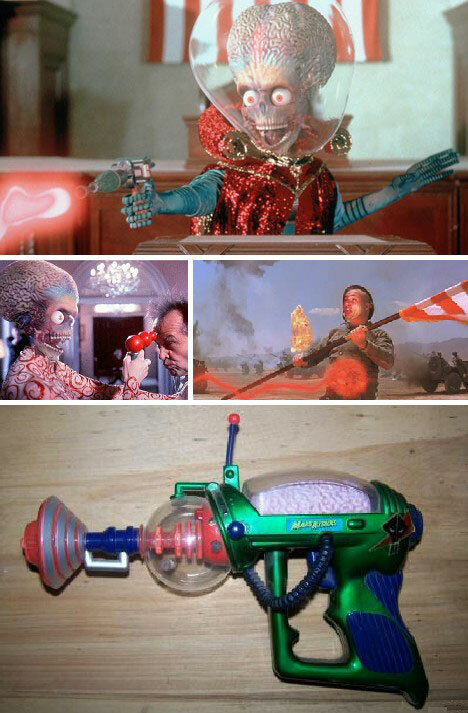 Mars Attacks!, Tim Burton’s 1996 tribute to fifties space invasion flicks featured everyone from Tom Jones to Slim Whitman… whose warbling tones proved to be the big-brained little green men’s nemesis. Before the blew their minds on Slim, however, the Martians were happily blasting any human they saw into smoldering ashes with their hand-held heat ray pistols. 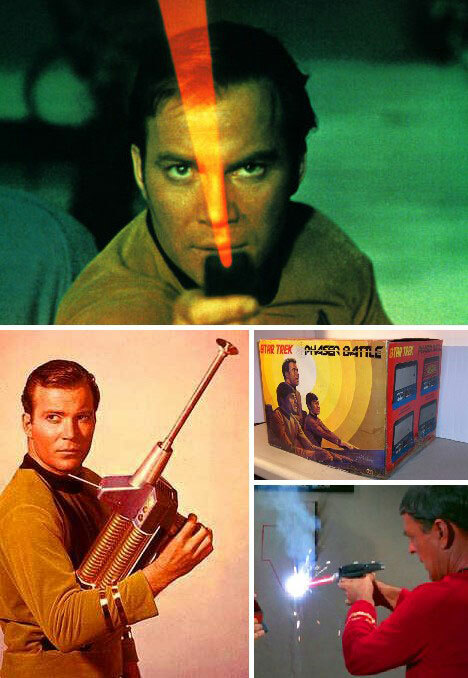 Word to the Pentagon: hurry it up already with that phaser research, bullet-firing guns are so Old West. When you call your company Joe Blow Glassworks, people tend to expect the unexpected. That seems to be what owner Jeff Burnette had in mind when he set up shop in a completely renovated, 2700 square foot former machine shop on Vancouver’s gritty east side. 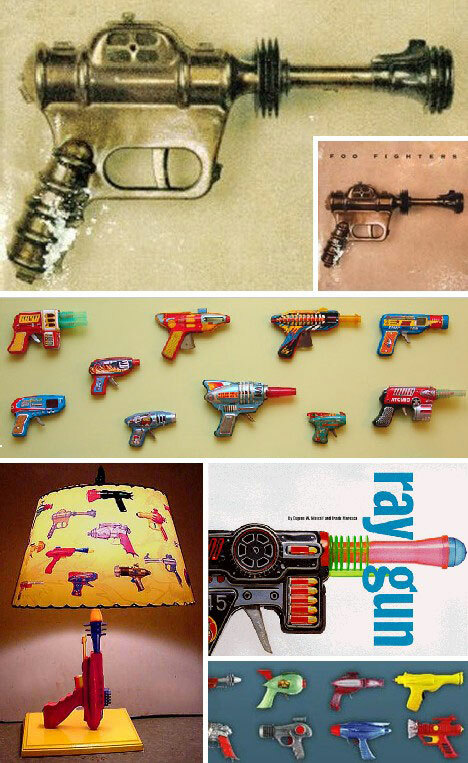 Among the wide range of ornamental glass objects turned out by hand at JBG are a delightful selection of rayguns, which Jeff calls “Raygunz”. Each one is hand blown and silvered to perfection, then mounted on a display stand. 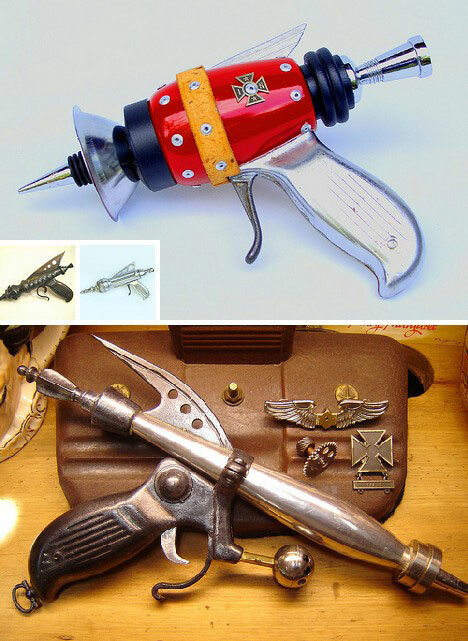 Surprised to know ray guns can be made of glass? Would you believe… wood? That’s the material of choice for The Builders Studio and they, like Kenny Rogers, know it’s the wood that makes it good. 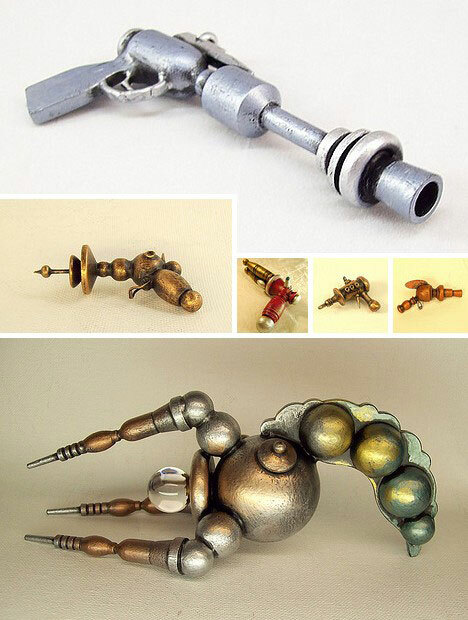 Available in a range of sizes from tiny pendants for your green alien slave girl to full size blasters, the rayguns and ray-rifles here exude an organic, almost Seussian quality. Tinkerbots is a guy who tinkers with robots, but you probably guessed that already. What’s surprising is how retro-cool his creations are. According to Tinkerbots’ Flickr profile, “I love things retro and sci-fi. 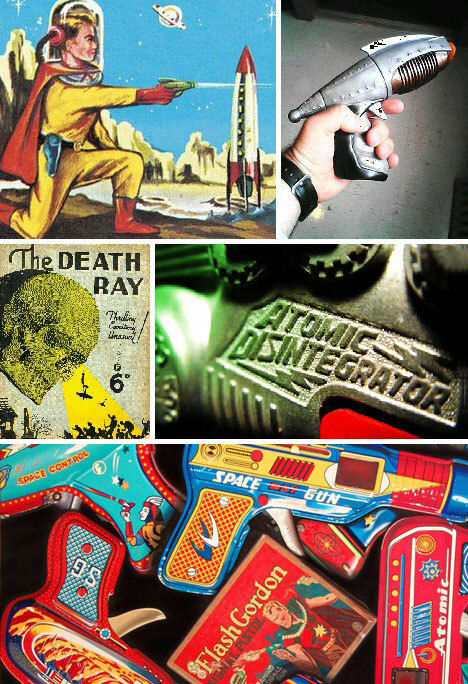 I like the feel of the 30’s, 40’s and 50’s, the days of radio and adventure…” and he expresses that love with an abundance of rayguns, robots and much much more. Bringing things to a happy ending, as it were, is the rather unique weapon wielded by Orgazmo in the 1998 movie of the same name. Created by Matt Stone and Trey Parker, the brains behind South Park, Orgazmo’s superhero gets to shoot a gun that causing the “victims” to immediately convulse in the throes of… well, you get the idea. 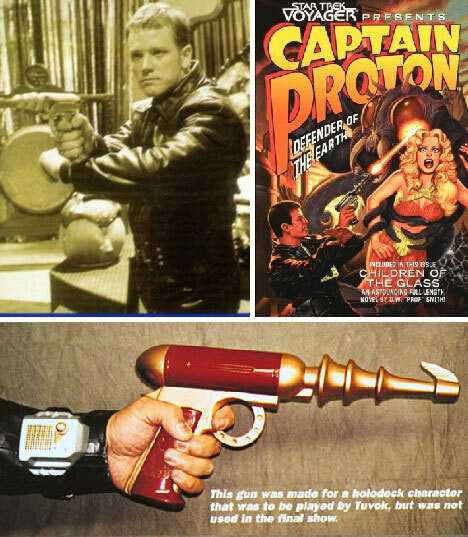 Beats a phaser blast or a death ray any day, though one might expect crime to increase if the good guys were armed with guns like these.